"With tender tenacity, he (Pope Benedict) is moving the church in a direction in which the fullness of the sacred liturgy and liturgical life will raise all mankind through her sacred art and sacred music." What an apt and lovely phrase, "tender tenacity." And what a high purpose we are called to! The Sacred Music Colloquium is a wonderful mixture of high quality music lessons and high quality worship and devotion services. Tonight we had an hour of Eucharistic Adoration, with Gregorian chants (of course), extraordinary polyphonic singing (Tantum Ergo, Palestrina), capped off with a magnificent organ playing for the recessional (Three Versets on Pange Lingua from Premier livre d'orgue, Grigny). Personally, I found that reciting the Litany of Loreto was heart rending (in a good way). It made me cry to be reciting "Ora pro nobis" after the cantor chanted out each of the names for the Blessed Virgin Mary, in a church filled with people. The Anchoress would have loved this. Chanting does open the heart and calm the mind. I've only ever seen the Litany of Loreto (or the Litany of Saints, for that matter) it on EWTN before. Live is way better than TV. Youn can listen to Dr. Phillip's lecture - and the Litany of Loreto - here (scroll down). "I Have a Mustard Seed and I'm Not Afraid to Use It." "A self-described revolution in world affairs has begun in the heart of one man. He is the Italian journalist and author Magdi Cristiano Allam, whom Pope Benedict XVI baptized during the Easter Vigil at St Peter's. Allam's renunciation of Islam as a religion of violence and his embrace of Christianity denotes the point at which the so-called global 'war on terror' becomes a divergence of two irreconcilable modes of life: the Western way of faith supported by reason, against the Muslim world of fatalism and submission." "As Magdi Allam recounted , on his road to conversion the challenge that Pope Benedict XVI offered to Islam in his September 2006 address at Regensburg was 'undoubtedly the most extraordinary and important encounter in my decision to convert'. Osama bin Laden recently accused Benedict of plotting a new crusade against Islam, and instead finds something far more threatening: faith the size of a mustard seed that can move mountains. Before Benedict's election, I summarized his position as 'I have a mustard seed and I'm not afraid to use it.' Now the mustard seed has earned pride of place in global affairs." "....Magdi Allam presents an existential threat to Muslim life, whereas other prominent dissidents, for example Ayaan Hirsi Ali, offer only an annoyance. Much as I admire Hirsi Ali, she will persuade few Muslims to reconsider their religion..... Why would Muslims trade the spiritual vacuum of Islam for the spiritual sewer of Dutch hedonism? The souls of Muslims are in agony. The blandishments of the decadent West offer them nothing but shame and deracination. Magdi Allam agrees with his former co-religionists in repudiating the degraded culture of the modern West, and offers them something quite different: a religion founded upon love." "....As I wrote in 2005, 'Now that everyone is talking about Europe's demographic death, it is time to point out that there exists a way out: convert European Muslims to Christianity.' Today's Europeans stem from the melting-pot of the barbarian invasions that replaced the vanishing population of the Roman Empire. The genius of the Catholic Church was to absorb them. If Benedict XVI can convert this new wave of invaders from North Africa and the Middle East, history will place him on a par with his great namesake, the founder of the monastic order the bears his name." Fascinating stuff! Hat tip to Jill at The Business of Life. * Matthew 17:20, "And Jesus said to them, Because of your unbelief: for truly I say to you, If you have faith as a grain of mustard seed, you shall say to this mountain, Remove hence to yonder place; and it shall remove; and nothing shall be impossible to you." It's been quite a wonderful Holy Week. Tonight at the Easter Vigil mass, during which churches welcome adults who have converted to Catholicism, Pope Benedict baptized seven people, including writer Magdi Allam. Wow. "Italy's most prominent Muslim commentator converted to Roman Catholicism on Saturday during the Vatican's Easter vigil service presided over by the pope." "An Egyptian-born, non-practicing Muslim, Magdi Allam has infuriated some fellow Muslims with his criticism of extremism and support for Israel. The deputy editor of the Corriere della Sera newspaper, Allam often writes on Muslim and Arab affairs." "....In the Il Giornale interview, Allam explained his complicated relationship with Islam and his affinity for Israel. 'I was never practicing,' he was quoted as saying. 'I never prayed five times a day, facing Mecca. I never fasted during Ramadan.' Yet he said he did make the pilgrimage to Mecca, as is required of all Muslims, with his deeply religious mother in 1991." "Allam also explained his decision to entitle a recent book Viva Israel or Long Live Israel, saying he wrote it after he received death threats from Hamas. 'Having been condemned to death, I have reflected a long time on the value of life. And I discovered that behind the origin of the ideology of hatred, violence and death is the discrimination against Israel. Everyone has the right to exist except for the Jewish state and its inhabitants,' he said. 'Today, Israel is the paradigm of the right to life.' "
CNN has a short video clip of Pope Benedict baptizing Magdi Allam. Robert Spencer discusses Magdi Allam's conversion and apostasy here. "Egypt's highest Islamic cleric, the Grand Mufti Ali Gomaa, wrote last year against the killing of apostates, saying there is no worldly retribution for Muslims who abandon their religion and that punishment would come in the afterlife." "Cairo: Egypt's top cleric yesterday denied in a statement that he had said a Muslim can give up his faith without punishment." "Ali Goma'a, the mufti of Egypt, was quoted as saying in a posting on a Washington Post-Newsweek forum that Muslims are free to change their faith and this is a matter between an individual and God." " 'What I actually said is that Islam prohibits a Muslim from changing his religion and that apostasy is a crime, which must be punished,' Goma'a said." May God bless Magdi Allam and keep him safe. Ditto for Papa Ratzi. I'vw written earlier about my reservations on the letter sent by 138 Muslims to Pope Benedict, "A Common Word Between Us and You." I recognized several of the names, and I distrusted their words and intentions. Patrick Poole found quite damning evidence of duplicity by one of the co-signers, Sheikh Said Hijjawi, and the very institute that produced the "Common Word" letter. The same institute, Royal Aal al-Bayt Institute for Islamic Thought in Amman, Jordan, also "issues fatwas condemning apostates and religious freedom." Lots of them. On Religious Freedom - "Another cause highly esteemed by all of you is the defence of religious liberty, which is a fundamental, irrepressible, inalienable and inviolable right rooted in the dignity of every human being and acknowledged by various international documents, especially the Universal Declaration of Human Rights. The exercise of this freedom also includes the right to change religion, which should be guaranteed not only legally, but also in daily practice. In fact, religious liberty corresponds to the human person’s innate openness to God, who is the fullness of truth and the supreme good. An appreciation for religious freedom is a fundamental expression of respect for human reason and its capacity to know the truth. Openness to transcendence is an indispensable guarantee of human dignity since within every human heart there are needs and desires which find their fulfilment in God alone. For this reason, God can never be excluded from the horizon of man and world history! That is why all authentically religious traditions must be allowed to manifest their own identity publicly, free from any pressure to hide or disguise it. Terrorism and Respect for Life - "Moreover, due respect for religion helps to counter the charge that society has forgotten God: an accusation shamelessly exploited by some terrorist networks in an attempt to justify their threats against global security. Terrorism is a serious problem whose perpetrators often claim to act in God’s name and harbour an inexcusable contempt for human life. Society naturally has a right to defend itself, but this right must be exercised with complete respect for moral and legal norms, including the choice of ends and means. In democratic systems, the use of force in a manner contrary to the principles of a constitutional State can never be justified. Indeed, how can we claim to protect democracy if we threaten its very foundations? Consequently, it is necessary both to keep careful watch over the security of civil society and its citizens while at the same time safeguarding the inalienable rights of all. Terrorism needs to be fought with determination and effectiveness, mindful that if the mystery of evil is widespread today, the solidarity of mankind in goodness is an even more pervasive mystery." Hmmm, we could use a lot more of the "solidarity of mankind in goodness." The Pope here is also warning the West about how it's carrying out the War on Terror. "In this regard, the social teaching of the Catholic Church offers some points for reflection on how to promote security and justice both at the national and international levels. This teaching is based on reason, natural law and the Gospel: that is, principles that both accord with and transcend the nature of every human being. The Church knows that it is not her specific task to see to the political implementation of this teaching: her objective is to help form consciences in political life, to raise awareness of the authentic requirements of justice, and to foster a greater readiness to act accordingly, even when this might involve conflict with situations of personal interest (cf. Deus Caritas Est, 28). In this her mission, the Church is moved only by love for humanity and the desire to work together with all people of goodwill to build a world in which the dignity and inalienable rights of all persons will be safeguarded." "The Pope has again risked provoking the wrath of the Islamic world, by criticising its treatment of Christians. " Really? Why, pray tell, would what Pope Benedict said - asking for religious freedom, criticizing terrorist acts carried out in God's name, and warning the West about how it is using force - why would that provoke "the wrath of the Muslim world"? Muslims around the world are victims of Islamist terrorist acts far more often than anybody else. 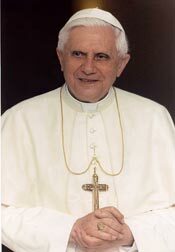 God bless Pope Benedict and keep him safe. He is a tireless defender of religious freedom and of the value of being a God-conscious society. Love that guy. PS: You're probably the first Papal secretary in history that's also in the spotlight next to the Pontifex: People Magazine swoons over the "Sunnyboy in the cassock", the Swiss Weltwoche calls you the "most handsome man in a soutane". Donatella Versace dedicated a fashion line to you. Does this image as a "ladykiller" (i.e. someone who looks like one) bother you ? MG: It didn't make me blush, but it irritated me a bit. It doesn't hurt and it was flattering, and it's no sin. I'd never been confronted like this with my "shell". Then I noticed that it was largely an expression of sympathy - a bonus, not a malus; I can handle that well. But, I don't want that people don't just look at me but also acknowledge the substance. PS: Nobody thought that after a "millennium Pope" like Karol Wojtyla a successor could be successful this quickly. Now, everything has changed. Not only that Benedict XVI. draws twice as many people. That his books are printed by the millions. Pope Ratzinger is viewed as one of the most important thinkers of our time. And, as opposed to his predecessor, he's rarely criticized. What does he have that others don't ? MG: With being Pope there comes a greater accessibility, a greater sphere of influence and a greater power of assertion. Someone very familiar with the goings-on in Rome said during the Bavaria trip last fall, "John Paul II opened the hearts of the people. Benedict XVI fills them." There is a lot of truth in that. The Pope reaches the hearts of the people, he speaks to them, but he doesn't speak of himself, he speaks of Jesus Christ, of God, and that in a descriptive, understandable and convincing manner. That is what people are looking for. Benedict XVI gives them spiritual nourishment. Pope Benedict is one tireless leader! He recently spoke to a crowd of 25,000 young people at Assisi, Italy, during his pilgrimage there to mark the 800th anniversary of the conversion of Saint Francis. (Francis was a party-hearty young man who loved gambling and fine clothes before his conversion to a life of serving Christ.) Despite the criticisms that Pope Benedict is hopelessly out of touch, that his ideas are hopelessly out of date, he attracts huge crowds of delighted fans wherever he goes. People are hungry for his message (God's message, really) of timeless, enduring truths. A translation of Benedict XVI’s address to young people at Assisi can be read here. "Dear young people, you have reminded me of some of the pressing issues for youth today, of your difficulties in building a future for yourselves and above all of your strained efforts to discover the truth. In the account of Christ’s passion we find Pilates question: “What is the truth?” (Jn 18,38). It is a question which resounds widely throughout modern day culture." Whooo-hooo! I got me one! Through a wonderful business associate in Milano, I was able to score a few Papa Ratzi 2007 calendars, Un anno con il Papa. Famiglia Cristiana (Catholic Family) magazine published the calendar, which features 14 glossy photos of Pope Benedict taken at Castel Gandolfo, the Pope's country residence near Rome. Each photo has a quote from the Pope's first encyclical Deus Caritas Est (God is Love). The calendar costs 5 euros, and 1 euro of each sale goes to a charity in Rwanda for orphaned street children. "Giancarlo Giuliani, who has been shooting popes for Famiglia Cristiana for 40 years, took the photographs.... 'He is more shy than Pope John Paul,' Giuliani said. 'But he was incredibly kind and willing.' 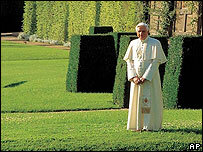 The photographer said he snapped more than 200 shots of the pope in the villa's chapel, library, office and gardens." "Abbiamo creduto all'amore di Dio... cosi il cristiano pue esprimere la scelta fondamentale della su vita." The 104th Catholic Carnival is up today. There's an excellent post about "peering into Pope Benedict's mind." Nativity scenes - The traditional tableau depicting the Three Wise Men visiting Jesus in a manger "is an important part not only of our spirituality, but also of our art and culture", the Pope said during his weekly audience at the Vatican. Where to see the face of God - "In the face of the little Jesus," said Benedict, "we contemplate the face of God, which is not revealed through force or power, but in weakness and the fragile constitution of a child...(Christmas) invites us to recognize the Infant Jesus in all babies, who are the joy of the Church and the hope of the world." Violence in the Middle East - Pope Benedict said that 2006 "remains in our memory with the profound imprint of the horrors of the war that took place in the surroundings of the Holy Land, as well as, in general, of the danger of a clash between cultures and religions, a danger that still threatens this historic moment." A recap of the Pope's trips to Spain, Poland, Germany and Turkey this year. "The child of Bethlehem directs our gaze towards all children who suffer and are abused in the world, the born and the unborn," said the spiritual leader of the world's 1.1 billion Catholics. Speaking in Italian, he pointed to "children who are placed as soldiers in a violent world ... children who have to beg ... children who suffer deprivation and hunger ... children who are unloved." He said: "In all of these it is the child of Bethlehem who is crying out to us. ... Let us pray this night that the brightness of God's love may enfold all these children. Let us ask God to help us do our part so that the dignity of children may be respected." AP Report: "While the pope spoke, police guarded churches in Pakistan and Indonesia, and in Bethlehem." 18,000 police were stationed at churches in Indonesia. Pray for the Pope, and pray for persecuted religious minorities. Merry Christmas to all! Six Catholic and Orthodox Christians writers - including Josh Trevino of The Brussels Journal - are already in Istanbul and blogging from there at The Pope and the Patriarch. Gorgeous photos taken of the Hagia Sofia here,The Pope is visiting the Hagia Sophia on Thursday, November 30. Keep Papa Ratzi in your prayers! "Sales of a controversial Turkish novel on a conspiracy to kill Pope Benedict XVI are on the rise ahead of the pontiff's historical visit to Turkey beginning next Wednesday - his first to an overwhelmingly Muslim nation. 'The Plot Against The Pope' is a highly speculative potboiler narrating how the conservative Roman Catholic society Opus Dei, a subversive masonic lodge and the CIA collude to make the pontiff's murder a pretext for a US attack against Iran." "Yuvel Kaya's book, which features Benedict XVI in front of a burning cross with a bearded gunman aiming a rocket launcher at him, is on sale at major Turkish bookstores such as D&R, Kabalci, Pandora." Ughhh. "Police on Wednesday detained about 40 members of a Turkish nationalist party who earlier had occupied one of Istanbul's most famous buildings, the Haghia Sophia, to protest the visit next week of Pope Benedict XVI. The protesters belong to the Great Unity Party, a far right-wing group that has previously staged demonstrations against the planned Nov. 28-Dec. 1 visit. They entered the 6th century former Byzantine church and mosque, shouting "Allahu akbar!" — "God is great!" — and then knelt to perform Islamic prayers. 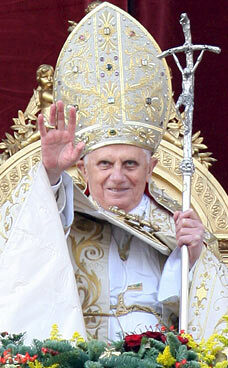 They also shouted a warning to Benedict: "Pope, don't make a mistake, don't wear out our patience." 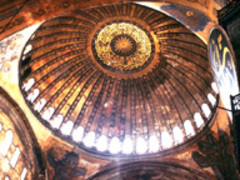 The Hagia Sophia wasn't just "one of the greatest churches" for 1,000 years, it was the greatest church, a "supreme masterpiece of Byzantine architecture." The conversion to a mosque included building minarets around the perimeter of the building complex and whitewashing Christian mosaic icons. The Hagia Sophia - with its lofty central domes supported on columns - served as model for the great Turkish mosques of Constantinople. The Ecumenical Patriarchate is proud to announce an official web site dedicated to the visit of Pope Benedict XVI to the Ecumenical Patriarchate of Constantinople from November 29 December 1, 2006. This site is now online at http://www.patriarchate.org. 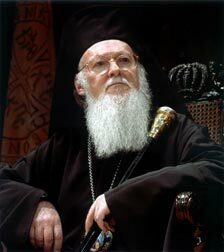 This website will provide resources for both the media and general public and currently offers extensive information about Ecumenical Patriarch Bartholomew, Pope Benedict XVI and the Ecumenical Patriarchate...."
Lots of videos, virtual tours and podcasts. Good FAQ page too. "In a lecture at the University of Regensburg, in Germany, last month, Pope Benedict XVI talked about "jihad" as holy war and about using religion as an excuse for destruction and death. He quoted from a debate in the 14th century between Manuel II Paleologos, emperor of the Byzantine Empire, and a Persian cleric..... The immediate response in the Muslim world was one of outrage. In the end, the pontiff was forced to apologize, and maybe revisit his ideas about Islam." When a book review begins with a misstatement like this, the bells go off - ding-ding-ding-ding!! 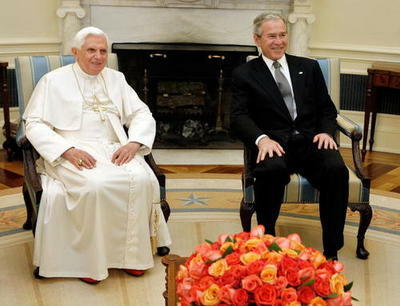 Pope Benedict did not apologize for what he said, he expressed regret that the Muslim world reacted with violence. 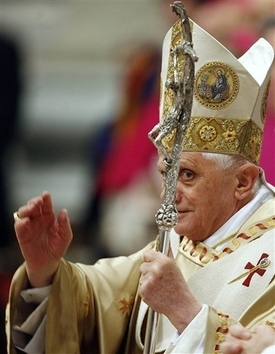 Pope Benedict has written and spoken about the nature and history of Islam for several years. I'm quite sure that he is not "revisiting his ideas about Islam" because of the riots, church burnings, and the deaths of a priest and a nun. The violence rather proved his point. Benedict's ideas are well formulated and based on an extensive historical and theological knowledge. "Thus, the fact that Eliot Weinberger's increased curiosity toward the Muslim world is due, in large measure, to George W. Bush's intolerance ought not to be seen as an impediment." Let's have some more of Stavan's ideology, shall we? I'm sure there's a book review in there somewhere! Finally, Stavans talks about Weinburger's book, which he dismisses as "useless" in a mere three sentences. Stavans then turns to Armstrong's book, noting that "she offers a panoramic perspective, meticulously following the path of the prophet from birth to death while analyzing the theological, social, economic, military, and cultural forces shaping him." She is criticized by Stavans for being didactic and having a stilted style. Armstrong is viewed by many conservatives (including Robert Spencer and Efraim Karsh) as sugar-coating Islam, ignoring or glossing over the unsavory aspects of its history. Speaking of Robert Spencer, why no mention here of Spencer's recent book, The Truth About Mohammed? His book is currently ranked 49th top selling book at Amazon.com, and #31 on the NY Times best sellers list. Hmmpphh, oversight on the part of the Stavans or the Boston Globe? Reviews of Spencer's book can be found here and here. "The sword isn't absent in the Koran. Neither are tales of wisdom and morality. Pope Benedict shouldn't waste time in proxies and surrogates. He would do well by reading the Koran directly. So would we." How do you say "chutzpah" in Spanglish*? Well, I think that we would all do well by reading the Bible (some of the Acts of the Apostles are fascinating), and better knowing the literary, philospohical and religious underpinnings of our Western culture. But I wouldn't say that in a book review. Stavans is far too heavy on ideology here, and his piece belongs on the op-ed pages. So many academics just can't help themselves. * Ilan Stavans is known for his research on Spanglish, which he calls a new American language, comparable to Yiddish and Ebonics. According to Wiki, he advocates teaching Spanglish in the classroom. Way to keep the kids back, Professor. Two things have struck me about Pope Benedict's lecture and its coverage in the media: one, the media didn't see that the Pope was speaking to the West as much as or more than to Muslims, and two, the media reported the lecture in a manner guaranteed to fan the flames of the Muslim world (which doesn't take much). And I've been disappointed (not surprised) that more Catholic leaders haven't supported the Pope. Big wussies! "Let us now turn to the statement in Benedict's lecture which has aroused the most anger. Benedict quotes the Byzantine Emperor's challenge to the learned Muslim: "Show me just what Mohammed brought that was new, and there you will find things only evil and inhuman, such as his command to spread by the sword the faith he preached." ....As a thought experiment, let's reverse the situation. Suppose a major spokesman for Islam publicly issued the challenge: "Show me just what Jesus brought that was new, and there you will find things only evil and inhuman." What would be the Christian response? Not to burn a mosque or an effigy of the Muslim spokesman, or to shoot a Muslim nurse in the back in Somalia. It would rather be to reply with some examples of just what makes the New Covenant new: the revelation that God is a Father who has a co-equal Son and Holy Spirit; that Jesus is God's Son made flesh; the Sermon on the Mount; the Resurrection of the body; the list would be long. As Irenaeus put it: he brought all newness, bringing himself. Such a statement would not make dialogue impossible; it would be an occasion for dialogue." "It's worth noting, however, that while consistent Christians and Muslims in fact hold the position of the other to be erroneous in important ways, the Christian is not obliged by his faith to subject the Muslim to dhimmitude nor to deny him his religious freedom. There is a serious asymmetry here, which Benedict has criticized before. The Saudis can build a multi-million dollar mosque in Rome; but Christians can be arrested in Saudi Arabia for possessing a Bible." Or a 22-million dollar mosque in Boston.